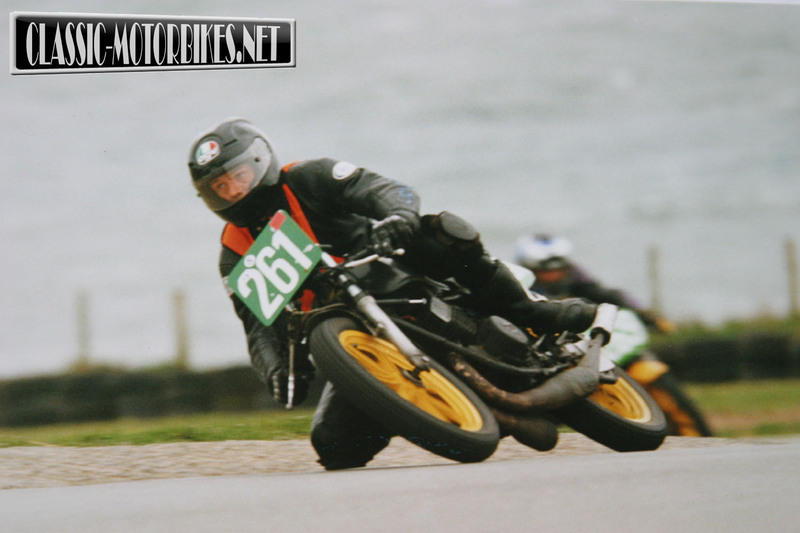 Apart from the fact the he wins, not just individual races but championships as well, Richard Insall is not in any way the typical motorcycle racer, he has only a passing interest in the mechanics of the bike and holds an incredible blind faith in other peoples claims for parts that he buys or uses. This shows the true character behind the man, it also goes to show that thanks to his almost unique out look and preparation techniques, bike racing doesn’t need to be the huge expense that many purport it to be. 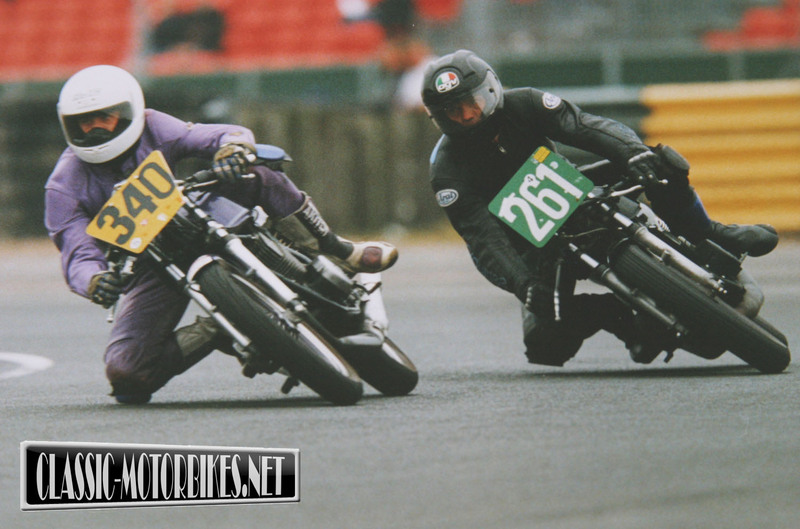 Having started racing very late in life, actually only two years ago, the 44 yr old builder from Stamford quickly got to grips with the game and was crowned the Earlystocks 250 class champ in only his second season of competition. Impressive stuff, but having now met Richard, his laid back, laconic attitude is completely in keeping with his other hobbies that include such pastimes as rock climbing, parachuting, photography and playing the electric guitar. Laid back and other such phrases are not expressions that can ever be used when describing his riding technique however with hard charging progress and crazy lean angles being the order of the day. 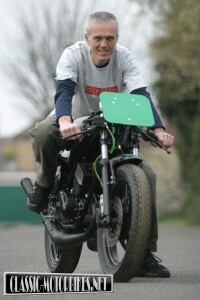 He did attend a race school a decade ago whereupon the instructor, the vastly experienced international racer Mick Corrigan, told him to start racing there and then, so visible was his undoubted ability on a bike, but like most things Richard does, it has to be on his own terms and in his own inimitable style. As for the bike, having already successfully competed with an RD250 then why change what he knows works well. The new 2004 machine has been built directly alongside the 02/03 specification racer and has only been improved in the areas found lacking. The old bike had proved to be super reliable which, apart from the odd bit of crash damage, had only required re ringing once during each of the two seasons it has been used. Usually, when writing about a race bike of any kind an adjective frenzy can be put to use as virtually every aspect is of great importance and a stunning performance enhancement, not in this case however, the only descriptive word one can conjure up is Just! Aside from a pair of conventional Hagon shocks, a Spondon rear swing arm was just about the only concession made in the handling department of the old RD. Even so this was enough to stave off the yearlong assault from other RD and X7 mounted Earlystock’s combatants. For the new machine a YPVS front end has been used although, as yet, unmodified or adapted from standard for racing and a pair of early model CBR600 front brake callipers have been adapted to fit this and the Yamaha cast wheel and twin discs. The idea behind using the Honda stoppers is to make available a whole host of trick pad compounds that are more suitable for fast use than the limited choice currently on the market for RDs. An FZ master cylinder capably does the business, via an array of Kermit green hoses, of relaying the orders to stop down to the twin piston Honda units. Every attempt has been made to replicate the exact ride height and wheelbase of the older spec machine, in the typical Insall “if it ain’t broke don’t fix it” style, although the use completely different running gear has at times made this task a little difficult. Either way the problems Richard has faced have been nothing that can’t be sorted with a few quiet moments to collect ones thoughts. Holding the Power Valve front end in place, the original RD250E yolks have been retained, more than likely so as not to open the head race can of worms, but the different ride height that the longer YPVS forks have created required the stanchions to be slid up quite a way in the triple clamps. Any one who knows the Power Valve chassis well will be aware of the slim waist design incorporated in the upper areas of the stanchion and this reduced diameter now lay exactly where the top yolk wanted to grab hold of it. Not a problem for the lateral thinking Richard, often faced with such changes of tack half way up a vertical rock face, oh no, the answer is simple, while other folk may well be off in search of even more parts at even greater expense, why not just make a pair of shims to fit between the legs and the top yolk, brilliant. And it works too! 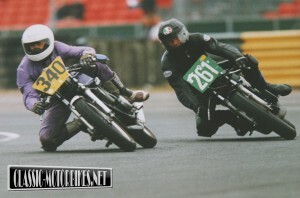 The Power Valve wheels have been no trouble to fit into the RD chassis, the front was easy thanks to the fork spacing being identical and the back would have been a doddle had it not been for the use of a lighter and smaller rear brake set up, “I never use it anyway so the smaller the better” quips Richard. 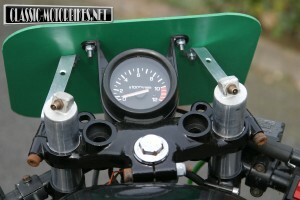 It made sense to make further savings in weight in this area especially as it is only the pre race scrutineer that is ever going to try it out so now in place of a large Yamaha brake sits a scooter specification Grimeca calliper, yet another frog green hose and master cylinder for the rear brake assembly. The price to pay for this set up has been the long and drawn out job of fabricating a few spacers here and there as well as the plate used to reposition the twin piston calliper correctly on the disc. 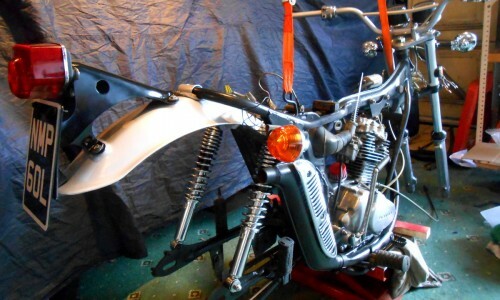 The frame is pure RD 250 although every lug and bracket not now holding anything in place has been removed to reduce weight. The RD chassis is virtually identical to the pure bred TZ so little else is needed to get it handling correctly once a few pounds have been shaved off and safely stored in the round file. The Raask rear sets, although the proper RD fitment, are a bit ungainly and cumbersome looking but Richard reports the after sales service and general help provided by the makers is well worth the down sides of the design. They do look business like but I for one cant help feeling Richard has let the side down slightly after all a reverse single gear lever would have been far more in keeping with “Insall” design and general minimalist philosophy! It must have broken poor old Richards heart to weld something on to his newly formed lithe and svelte frame but a bracket has been added to the top frame tube to facilitate the fitting of the later model tank. Faced with the styling impact alone it is well worth the extra few ounces that have been laden upon the frame, Richard got his own back however when designing the paint scheme and chose to put the Yamaha logo on reversed, this is not only different, it also creates a nightmare for the Mechanics design department having to ensure the photos are not reversed before going to print. 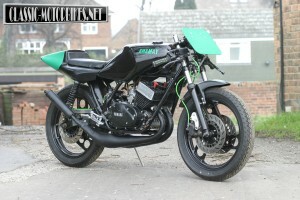 The Power Valve tank, mated with an R6 seat unit, gives the bike an unusual, travelling at 100mph while standing still, stance, not a lot unlike the Daytona 400 or those trick RD’s the far eastern boys were riding while we still had the coffin tanked E’s to play with. 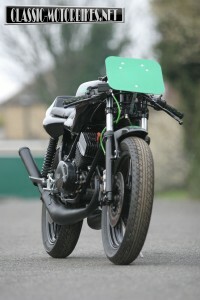 A pair of specially made, slightly longer, upside down Hagon shocks dutifully hold up the rear end and combined with the box section Dresda swing arm it is hoped the RD will be obedient on the track. Hagon shocks are quite simple both in design and construction and yet are very capable units combining lightweight with efficient damping action that should prove a good choice when battle commences. As yet, little is known by Richard concerning the full spec of the engine and it has been fitted exactly as bought from a fellow racer, the previous owner claims to have been clocked at 120mph down the long back straight at Snetterton with this very power plant. It is rumoured to be a Stan Stevens stage three tune but only time will tell once the bike has completed a practise session or made it to the grid for the first Earlystock’s race of the year. The usual race mods, like removing the oil pump and kickstart shaft, have been carried out so aside from setting up and maintaining there should be little left to do. One thing is for sure, the pipes that came with the engine look beautiful, with the main section being blown out of two flat pieces of steel, pre shaped and then welded together before being forced into shape under immense pressure. The result is a totally seamless expansion chamber area with the only welds present either running the length of the gas flow or at the very ends of the important bit and attaching the front pipe and rear stinger to the main chamber. Undoubtedly the pipes were originally made for an early TZ250 but they should still work very well as the RD shares the same bore and stroke with the 70’s GP machine. The standard 28mm Mikuni round slide carburettors have been junked in favour of a pair of Kawasaki KRIS flat slide Keihins, these should give a smoother more instant mid range as well as helping the tuned engine breath better when at full chat. Either way the later design carbs should provide a greater degree of control and fine tuning when the day come to run the bike in anger. The two Keihins are now actuated by a single pull fast action twist egrip that in turn pulls the twin cables via the standard Yamaha junction box. The sparks are provided, quite reliably by a Boyer Bransden Ignition unit, with the timing set at 22deg BTDC. Being a total loss system this requires a 12 volt battery to be fitted for power, albeit it nothing like the size of an original Yam item, but is still worth the extra bit of weight this creates as in return the massive standard rotor is junked completely, using only a tiny arm mounted on the crank end to trigger the ignition box. 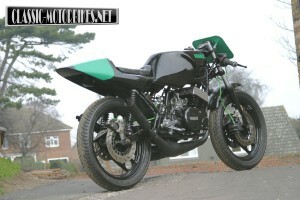 This creates a huge and valuable saving in reciprocal mass and as such should far out weigh the losses encountered by the batteries small presence in the all up weight of the bike, enabling the engine to spin up quicker and making down shifts and fast entries into corners much smoother. Richard reports that despite a lack of a charging system the small battery will comfortably run the ignition for a whole racing weekend. Luckily there is also a convenient feed wire off the Boyer Bransden loom enabling a drive to an electric tacho and a used item from a Yamaha TDR250 has been implemented, sitting all alone smack bang in the middle of the dash area. Within a month or so the latest RD will be taking to the track for its first shake down session, Richard has already had it up the road, so to speak, and reports a good, driveable engine although no high speed runs have yet been carried out.